A senior disciple of Carnatic saxophone pioneer Padmashri Dr. Kadri Gopalnath, Prasant has over 15 years teaching experience and is known as a dynamic and meditative performer of Carnatic music on the saxophone. 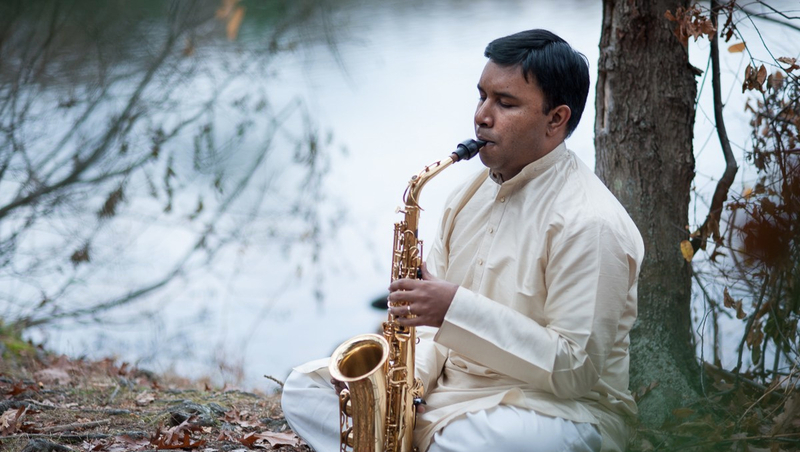 Prasant learned Carnatic music on saxophone by visiting, traveling and living with his teacher as well as performing alongside him starting in 1996. He also studied jazz with prominent saxophonists at the University of Southern California. This unique blend of experience allows for a wide perspective on music. He brings an approach to music that is completely holistic and fully personal for each student. Music practice can be a transformative exploration of the highest order allowing for total happiness and freedom in all aspects of life. Prasant teaches music locally in the San Francisco Bay Area as well as over Skype to students all over the world. Students of all levels and backgrounds are welcome. Here are some photos of Prasant with some of his students at local student performances in the Bay Area (Fall 2015 and Summer 2016). Photos by Donna Tung and B.D. Radhakrishnan. Prasant with some of his bay area students and their families. Lots of smiles!